This week I had one photo already accounted for which gave me 7 days to concentrate on the other one. Unfortunately the weather wasn't cooperating, and I had a general disinterest in shooting anything. For the +Weekly Photo Project 2013 our theme was Other Photographers. Last year it required me to go into my archive to find a photo where I had inadvertently captured another photographer. This year I used a shot I took a couple week earlier specifically for this project. When I first saw these two it was just as a wave was going to hit and I thought for sure they were going over. But they didn't even react to it and kept at it. They were taking turns shooting and modeling. Talk about a dramatic portrait session. This week was an all black & white affair; one of necessity and one to cover up bad lighting. Let's start with my black and white group's photo. Our theme was abstract, and this was a challenge for me. I don't like looking for or thinking in the abstract. 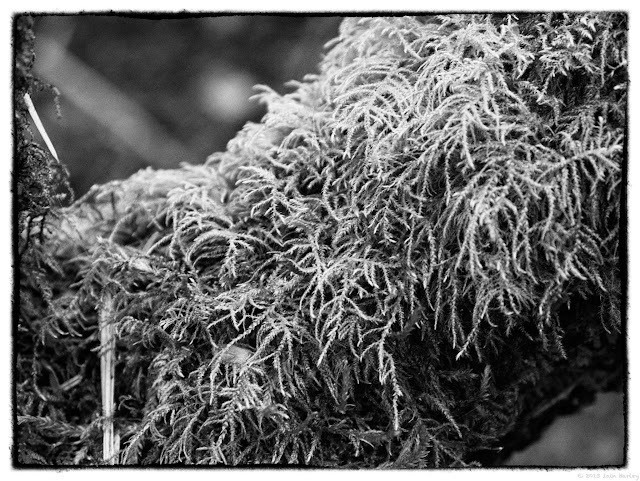 So I interpreted it as a close up of moss on a tree. I was happy with the outcome and love what Silver Efex 2 can do to a photo. Not my favorite theme or photo, but I think it turned out ok. I didn't want to post this shot. Not because I didn't like it, I do, but it's the third or fourth shot from the same outing. The darn clouds give it away! I liked this shot because the hillside foliage is nicely illuminated, in the background you can see the mists hugging the coast, and the sun trail on the ocean. This was a seven shot HDR shot... or composition. I'm not sure if "shot" is the right word for a photo like this that's made up of seven other photos. In terms of processing I didn't do that much. It came out of Photomatix looking pretty good and instead of my usual Topaz Labs Adjust to Detail, to Aperture workflow I normally do, I only used Detail to sharpen things up a bit then played with curves back in Aperture. This past week was pretty easy for me. The theme for the black & white group was rule of thirds, which wasn't one of my favorites because I try to shoot that most of the time. What was difficult was finding something I wanted to shoot. I looked at my other photos and saw I had a drinks sub-theme going on, so I thought I'd continue it for week 6. I think this will probably be my last drink theme photo though because I don't have any other glasses that help convey the drink. Well, except for the champagne flutes. Hmm... wonder how I can fit them in a shot. 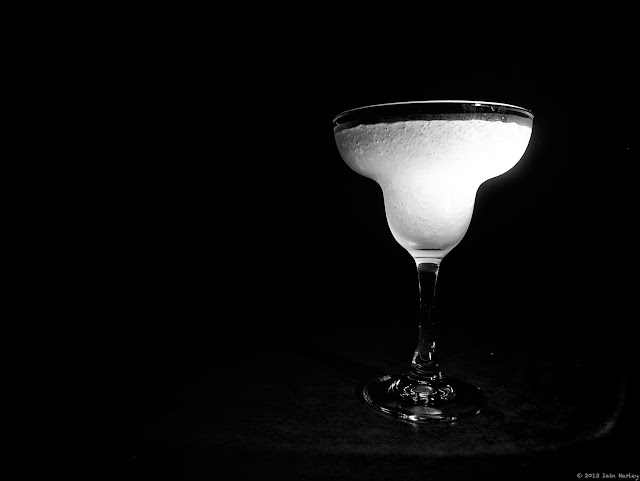 The setup for this shot is the same as the ice cube shot, just a hand held flashlight. I have a hard time taking photos of waves. Actually, based on the many shots I have I don't have a problem taking the photo, I have a problem with liking them. I almost like this shot. You get a sense of its size and power with part of it crashing against that fairly large sized rock, but still see the rest of the wave. It's like a before and after sequence in one shot. 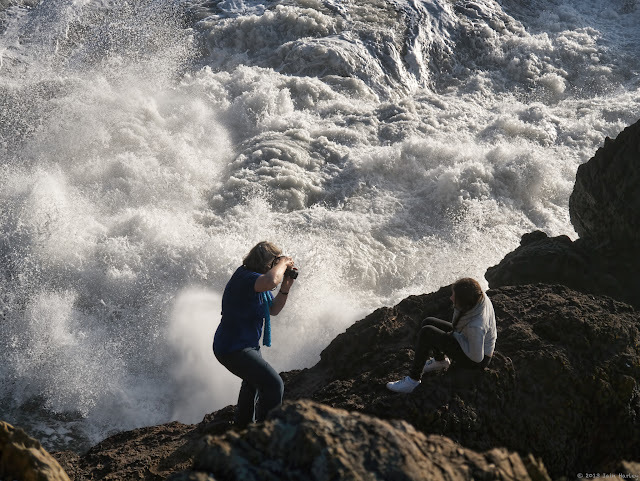 The northern California coastline was treated to a some bigger than normal waves in January. The waves are so big that there's a well known surf competition held every year because of the waves. This spot was a little too rocky for the surfers, but just a little south of this surfers were taking full advantage of the waves. Between the very cold Pacific Ocean and the large waves I can't decide which is crazier! This week I'm happy to be happy with one of my photos, which is better than I thought I'd be. For the black & white group the theme was the very new agey sounding "color without color". 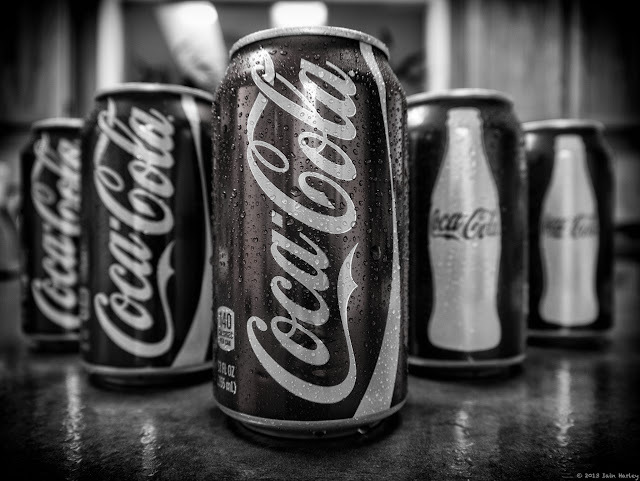 So I took the iconic Coke can and shot that. Everyone should know the Coke can is red. For this shot, and continuing my sub-theme of non-compliance, I very lightly brought some red back into the first can. I found this to be harder to do than I imagined. It's more noticeable if you view the photo full screen.